The American Red Crosshas launched a large relief operation across 11 states to help people affected by yesterday’s devastating tornado outbreak in the South and Midwest. Weather experts reported as many as 95 confirmed tornadoes touched down, destroying communities from the Great Lakes to the Southeast. “Our hearts go out to everyone who has been affected by this week’s severe storms,” said Charley Shimanski, senior vice president, Disaster Services. “Our top priorities right now are making sure people have a safe place to stay, a warm meal and a shoulder to lean on as they begin to clean up their neighborhoods. The Red Cross is also working closely with our government and community partners to make sure everyone gets the help they need.”Friday night, the Red Cross opened or supported 22 shelters in Missouri, Illinois, Kentucky, Oklahoma, North Carolina, Alabama, Indiana, Ohio, Tennessee, Virginia and West Virginia. Across the affected states, trained Red Cross disaster workers are mobilizing to begin feeding operations and distribution of relief supplies. Red Cross health services and mental health workers also will be out in neighborhoods help people cope with what they’ve seen and experienced. And damage assessment teams will also help the Red Cross and our partners discover the full scope of the damage. 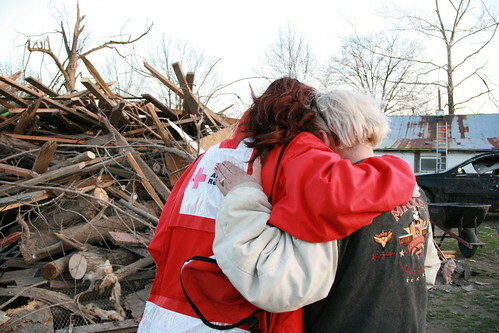 If someone would like to help people affected by disasters like tornadoes and floods, they can make a donation to support American Red Cross Disaster Relief by visiting http://www.redcross.org, calling 1-800-RED CROSS (1-800-733-2767) or texting the word REDCROSS to 90999 to make a $10 donation. Contributions may also be sent to their local Red Cross chapter or to the American Red Cross, P.O. Box 37243, Washington, DC 20013. Locate a shelter. People can find Red Cross shelters by contacting local emergency officials, visiting www.redcross.org, or calling 1-800-REDCROSS (1-800-733-2767). iPhone users can download a free Red Cross shelter view app from the app store. Those affected can let loved ones know they are safe by registering on the secure Red Cross Safe and Well website, where they can also update their Facebook and Twitter status. If you don’t have computer access, you can also register by calling 1-800-RED CROSS (1-800-733-2767). Loved ones outside the disaster area can use Safe and Well to find information about loved ones in the affected areas by using a pre-disaster phone number or complete address. Smart phone users can visit www.redcross.org/safeandwell and click on the “List Yourself as Safe and Well” or “Search for friends and family” link. Stay out of damaged buildings and immediately report any fallen power lines or broken gas lines to the utility companies. Use flashlights, not candles when examining buildings. If someone smells gas or hears a hissing noise, they should open a window, get everyone out of the building immediately and call the gas company or fire department. More tornado safety information is available on the Preparedness Section of the Red Cross website. You can help people affected by disasters like floods and tornadoes, as well as countless crises at home and around the world, by making a donation to support American Red Cross Disaster Relief. Your gift enables the Red Cross to prepare for and provide shelter, food, emotional support and other assistance in response to disasters. Visit http://www.redcross.org or call 1-800-RED-CROSS. Contributions may also be sent to your local American Red Cross chapter or to the American Red Cross, P.O. Box 37243, Washington, DC 20013. Shelters open, Red Cross helping to assess damage. The American Red Cross is helping people across the Midwest after tornadoes slammed into parts of Kansas and Missouri early this morning, injuring dozens of people, destroying buildings and leaving thousands without power. This is the third time tornadoes have devastated parts of Missouri in less than a year. The storm threat continues today with officials warning severe storms will continue in the Mississippi, Ohio and Tennessee valleys. One of the areas affected is Branson, Missouri where officials reported some people were trapped in their homes and buildings in the city’s famous theater district are heavily damaged. In Kansas, Governor Sam Brownback declared a state of emergency for the affected areas southwest of Topeka. 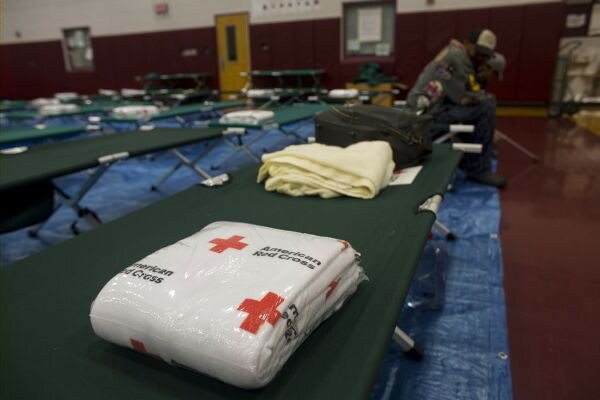 Red Cross workers in Missouri have opened shelters and are providing meals for displaced residents. Additional workers are fanning out in affected neighborhoods to begin assessing the extent of the tornado damage. . In Kansas, tornadoes damaged homes and search and rescue teams are searching for missing residents in the wreckage. Red Cross chapters are preparing to open shelters and are serving meals to those affected as well as emergency responders. 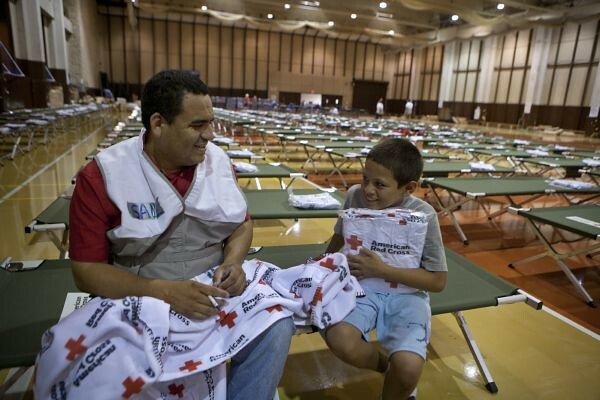 To find an open Red Cross shelter, visit www.redcross.org or call 1-800-REDCROSS (1-800-733-2767). iPhone users can download a free Red Cross shelter view app from the app store. With the threat of more storms today, residents should be on the watch for tornado warning signs such as dark, greenish clouds, large hail, a roaring noise, a cloud of debris or funnel clouds. It’s a good idea to secure outside items such as lawn furniture or trash cans, which could be picked up by the wind and injure someone. If a tornado watch is issued, it means tornadoes are possible and people should be ready to act quickly. If a tornado warning is issued, it means a tornado has been sighted or indicated by radar and people should go under ground immediately to a basement or storm cellar or to an interior room such as a bathroom or closet. People should use flashlights, not candles, when examining buildings. If someone smells gas or hears a hissing noise, they should open a window and get everyone out of the building immediately and call the gas company or fire department. Check for injuries. If someone is trained, they should provide first aid until emergency responders arrive. People should listen to their local news or NOAA Weather Radio for updated information and instructions. or more information about how to stay safe if tornadoes threaten someone’s community, people can visit the preparedness section of www.redcross.org. About the American Red Cross: The American Red Cross shelters, feeds and provides emotional support to victims of disasters; supplies more than 40 percent of the nation’s blood; teaches skills that save lives; provides international humanitarian aid; and supports military members and their families. The Red Cross is a not-for-profit organization that depends on volunteers and the generosity of the American public to perform its mission. For more information, please visit redcross.org or join our blog at http://blog.redcross.org. Editorial note: Call (202) 303-5551 to speak with an American Red Cross spokesperson on the ground. Visit the Red Cross Disaster Online Newsroom for hurricane preparedness and response information, including photos, video and press releases. Red Cross Emergency Response Vehicles are staging near Raleigh NC before Hurricane Irene's expected landfall. 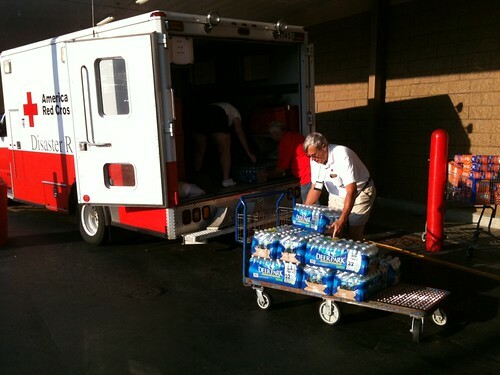 ERV crews stocked up Thursday with bottled water and snacks at a local warehouse store. The American Red Cross has launched a major relief operation all along the eastern seaboard to help people in the path of Hurricane Irene. More than 13,000 people spent Friday night in hundreds of shelters opened across several states. Many more shelters are set to open throughout the weekend as the storm moves to the north. Thousands of Red Cross disaster workers are helping people fromNorth CarolinatoNew England. More than 200 emergency response vehicles have been mobilized, and tens of thousands of prepackaged meals moved into the area. Volunteers from partner organizations like AmeriCorps NCCC and the Southern Baptist Convention are working alongside Red Cross volunteers in some areas. Those heading to shelters should bring extra clothing, pillows, blankets, medications, personal hygiene items and important documents. They should remember special items for children infants such as diapers, formulas and toys, along with necessary items for family members who are elderly or disabled. People should not leave their pets behind, but the Red Cross cannot accept pets in its shelters except for service animals for people with disabilities. People should check if organizations are setting up animal shelters. Red Cross chapters have lists of pet-friendly hotels, kennels, veterinarians and animal welfare agencies that can accept pets during a disaster. It’s important to make sure pets are wearing secure collars with up-to-date identification. Irene has forced the cancellation of dozens of blood collections along the East Coast. The Red Cross is urging immediate blood and platelet donations in areas unaffected by this storm and asks that people in the affected areas consider donating blood once the storm passes through and it’s safe to do so. If someone would like to help, they can make a donation to American Red Cross Disaster Relief by visiting www.redcross.org, calling 1-800-RED CROSS, texting the word REDCROSS to 90999 to make a $10 donation. They can also send contributions to their local Red Cross chapter or to the American Red Cross,P.O. Box 37243,Washington,DC20013. MANITOWOC — Wisconsin chapters of the American Red Cross will aid victims of Hurricane Irene, which is slated to impact much of the East Coast beginning as early as today. Red Cross spokesperson Barbara Behling said as of early Friday afternoon, eight trained Red Cross members from northeastern Wisconsin — including Manitowoc resident Rich Davis — were on their way to North Carolina, where the storm is expected to hit first. She said the number of trained volunteers is increasing and she anticipated at least a dozen by today. The Red Cross is planning to send about 600 Red Cross volunteers from across the nation to the East Coast. Behling said sending area residents to a potential disaster site makes the local community stronger.